Vegetable Boxes have now finished for this year. We will keep you posted as and when more produce becomes available. As part of our Environmental Curriculum we grow many different varieties of fruit and vegetables in our allotment which we sell back to our community to promote healthy eating and to raise money for the allotment. If you wish to order a box your name will go on a waiting list and we will contact you when it is available. All boxes will be ready to pick up on a designated day. Contact to tell you that your box is ready will be made via telephone, so please make sure you leave your mobile number, or a telephone number where you can be easily contacted. Boxes will be ready for pick-up at 3.30 pm on the date advised in the text. If any box is not collected on the designated day you will still be required to pay for the box and collect it on the following day. The pick-up point will be from the school office. 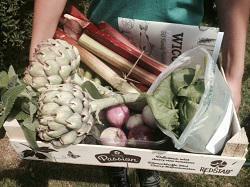 £5.00 - Organic Vegetable Box: A box of mixed vegetables and fruits. The box will also contain recipes for some of the produce, especially if they are a little more unusual, such as chard. There will be a minimum of 6 items per box. Last year there was a selection from the following: potatoes, onions, carrots, garlic, beetroot, squash, chard, tomatoes, courgettes, raspberries, mint, rhubarb, blackberries, salad leaves, radish and spring onions. Make sure that you leave a relevant telephone number. Your name will then be added to the waiting list. Wait for the call informing you of your designated pick-up date. Thank you for ordering from Wicor Primary School. Please complete the form below and click send. Make sure that you leave a relevant telephone number. Your name will then go onto the waiting list, and you will receive a call with your designated pick-up date. Vegetable Boxes cost £5.00 each, payable on collection.